All your life, you have been told "stand up straight...watch your posture". Hopefully, you have taken that advice. You will look better and have more energy if you do. Actually, there is much more to posture than most people realize. Your posture is the position of your ligaments, muscles, and spinal bones, and the condition they are in. 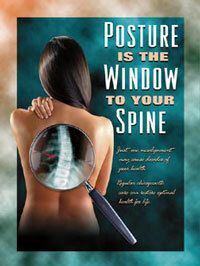 Posture is the window to the spine. If posture is out of balance, then the spine is out of balance, putting unhealthy pressure upon your nervous system. Activities as subtle as sleeping, standing or walking abnormally: to more obvious traumas like emotional stress, work or auto injuries, recreational injuries and even the birth process itself can result in spinal imbalance. Your spine is the most important factor affecting your posture. In order to have the best possible posture (and health), your spine has to be in the best possible condition. Optimal posture is a vital key to achieving optimal health for each person in your family. Early detection and elimination of subluxation will lead to a healthy nervous system at any stage of life. From a rear view your spine should be perfectly straight, and each of the 24 spinal bones stacked precisely on top of each other. Looking at the spine from the side you should see three curves, each having a 60' arc. It's been observed in nature, engineering, physics and geometry that a 60' arc offers the strongest defense against the destructive forces of gravity and motion. © Copyright - The Waiting List Practice. All rights reserved.